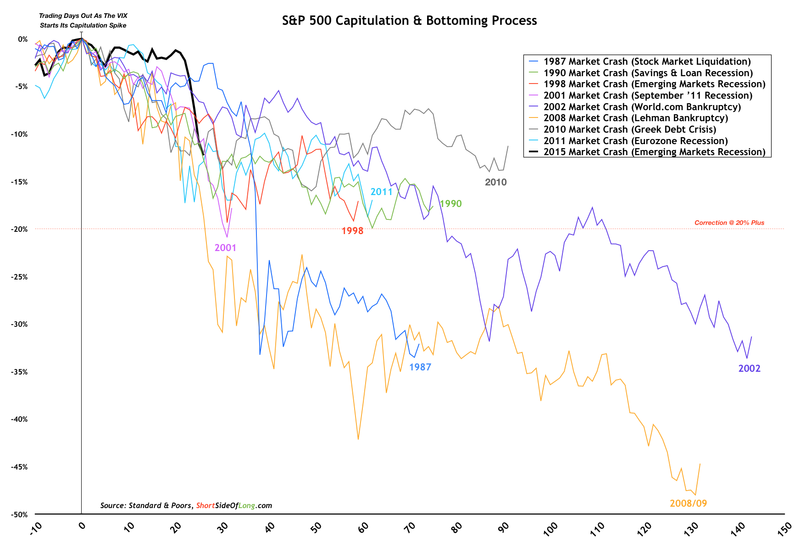 After such a steep collapse and catapult readings in fear indicators, the market historically needs some time to consolidate and recover. The pattern should be that the rally of the last 3 days gives way imminently and we retest the lows. That point would then be the next key test. Bulls should be looking to see a double bottom or lower low on positive divergences from which price then resumes a bull trend to new highs. The best fit timeline by geomagnetism/seasonals would be a bottoming out in October and Xmas new highs. 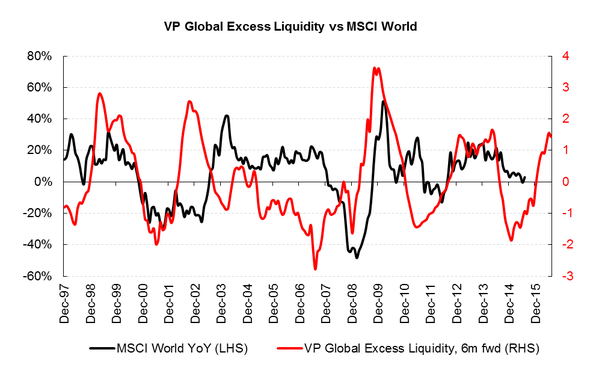 Supporting this scenario is liquidity trends. 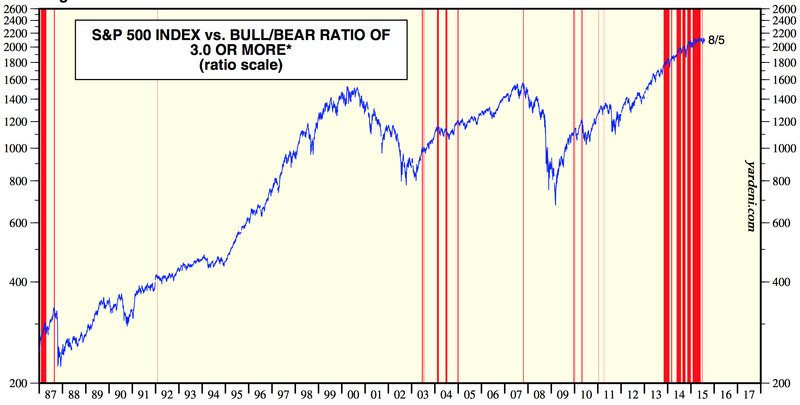 However, I rather see the overall evidence as supportive of stocks now being in a bear market. 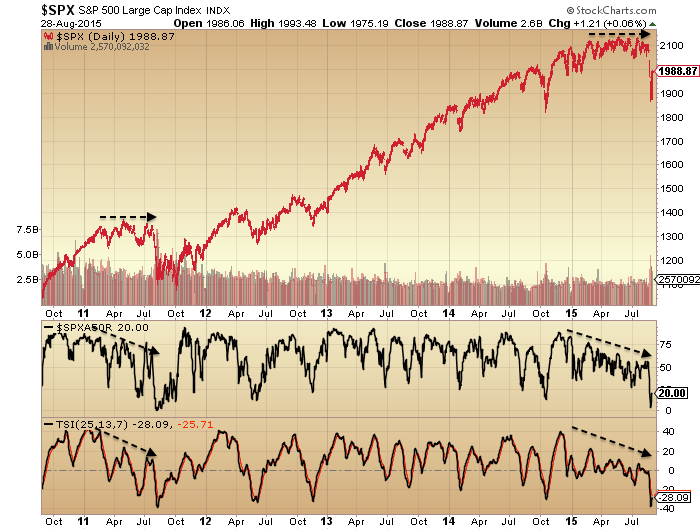 Drawing together all the indicators and disciplines that I trust, the data suggests stocks entered a topping process Jan 2014, made a first major peak in June/July 2014 with the solar max, made a first major low in October 2014 and a final second peak in May 2015. 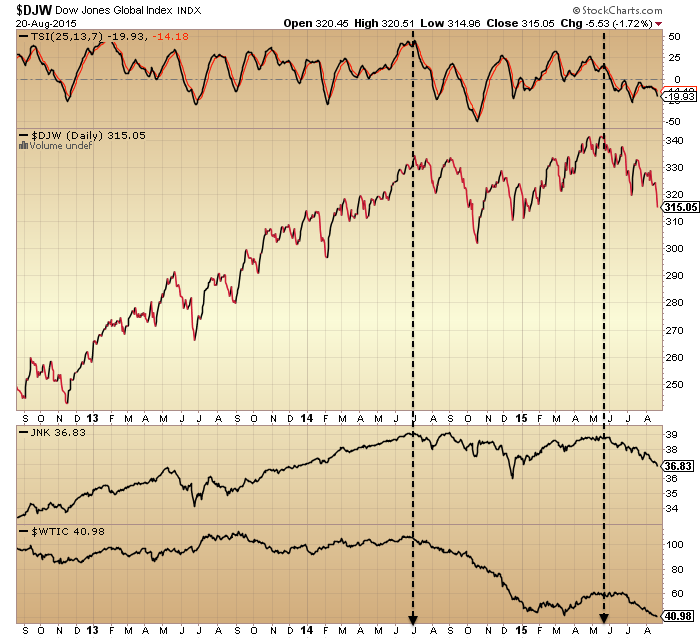 Several indicators reflect this progression, so here is one: stocks to bonds. 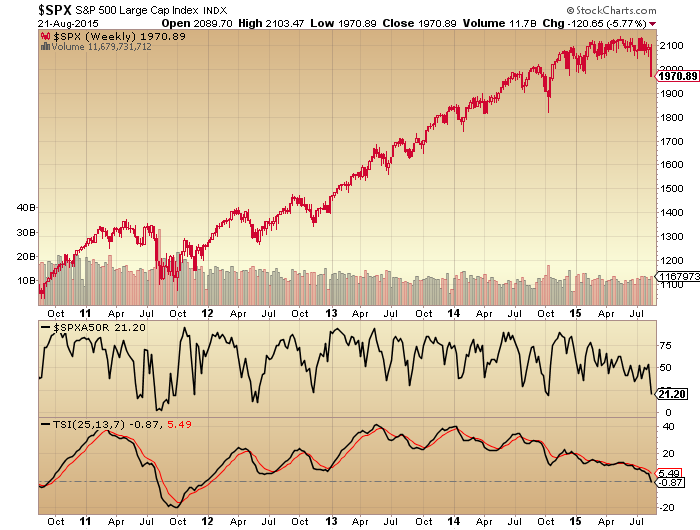 Capilulative breadth too, which hit its highest ever reading last week. If we take the bull angle again, then we could argue that such readings are a springboard to much higher prices, but we need to explain why they have anomalously occurred at <10% from the highs. If buybacks were to blame for the shallower washout in nominal prices then we should have seen small caps and non-buyback large caps collapse whilst buyback large caps held up, but this has not been the case. All in all, I think the extreme bearish readings we are printing this year in various indicators are a fair match for the all time record bullish readings we saw last year, namely that the markets have become excessively unbalanced. 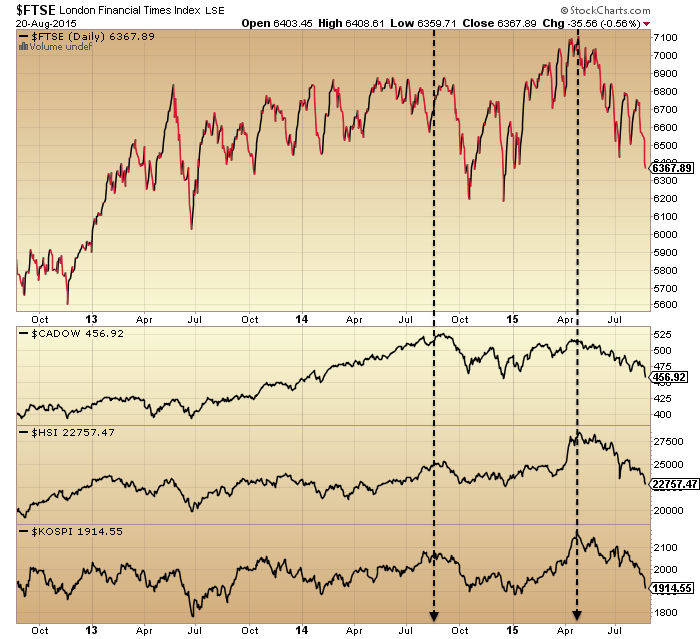 But, what can we can say for sure is that multiple indicators that were screaming for a reset in equity prices have now been satisfied (such as breadth, sentiment divergences), which makes the next move particularly telling. Again, bulls see this as a refuel for eventual higher prices, but certain big picture indicators make any such notion that we have now reset rather foundation-less. Which brings us to our particular environment not seen in over 50 years: ultra low rates, low inflation and overall deflationary trends. 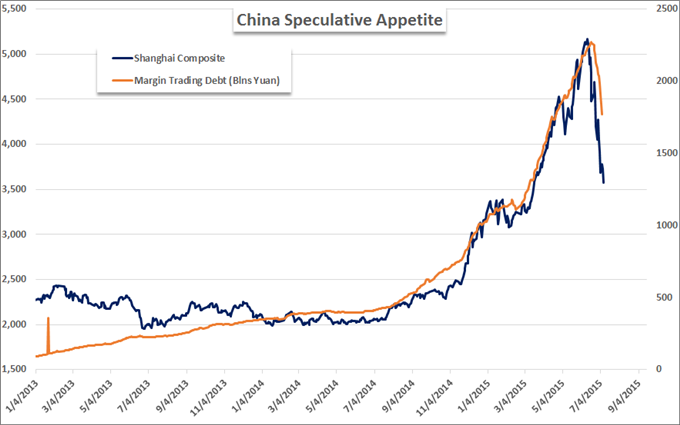 Are such valuations and leverage fair in the context of ZIRP? It’s a really useful test. 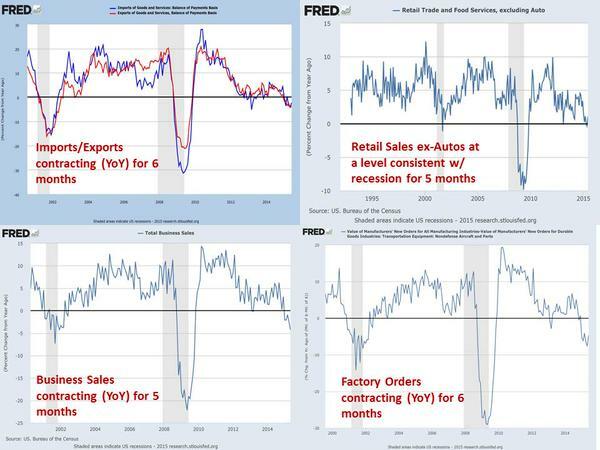 If stocks are in a bear now and break down, then it will be without high rates or oil prices ‘choking the economy’ and despite QE ongoing in several major nations. It will be clearer that valuations do not need recalculating in the context of low rates and low inflation. In short, it will be much more supportive of my dumb model of the markets: demographics and solar cycles. On that note, what I see as most important here is what has been offsetting demographic trends, namely increasing leverage. 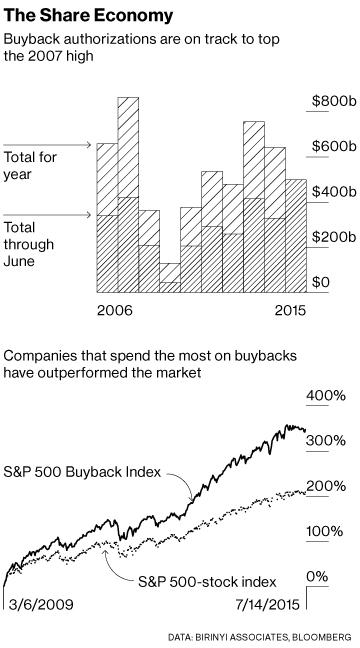 Buybacks through borrowing continue, but did so at record levels in 2007 despite stocks breaking down into a bear. 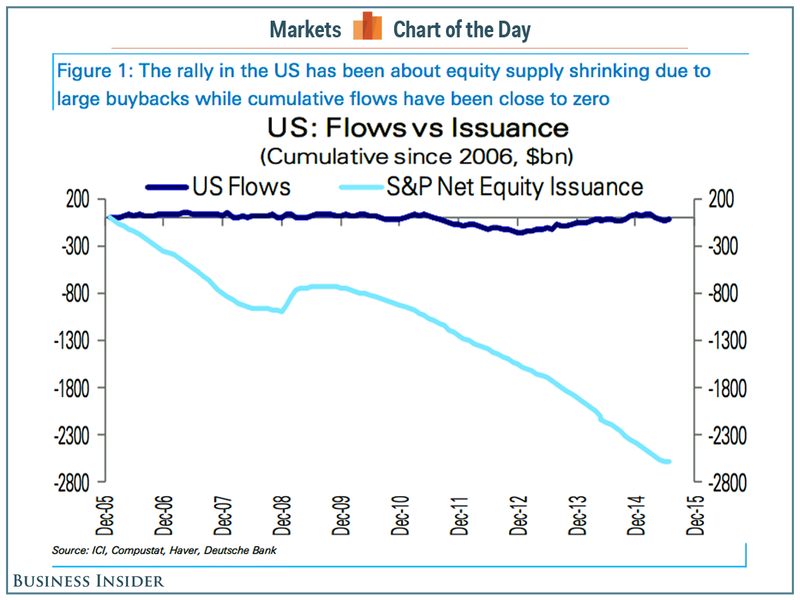 Buybacks didn’t stop the collapse occurring last week. 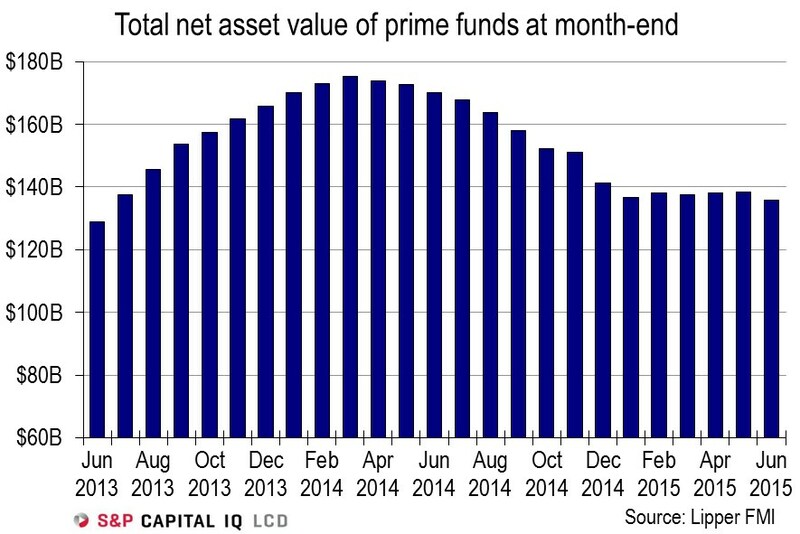 Margin debt dropped in July, and likely dropped harder in August. If stocks are to rally to new highs then leverage has to recover and make new highs too. However, what I see as likely is that a section of high leverage participants were wiped out last week and all-round appetite for high borrowing levels has been dealt a decisive blow. 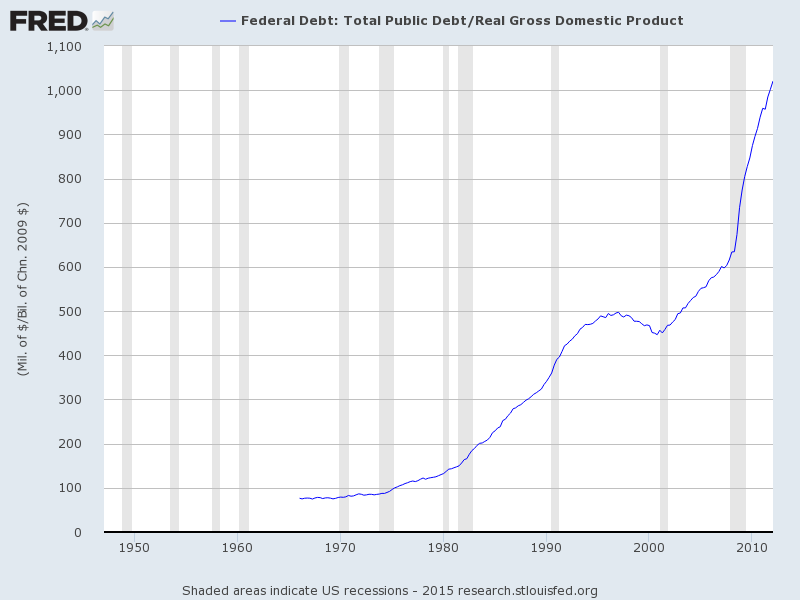 I very much doubt from here that leverage will make new highs. Using Rydex as a proxy for retail, I would argue the craziness has been broken and we will now see a gradual reversion to mean. Looking cross-asset, I believe gold will now make a higher low than the July low and in so doing cement its new bull trend, completing the gold and equities flip at the cyclical level. 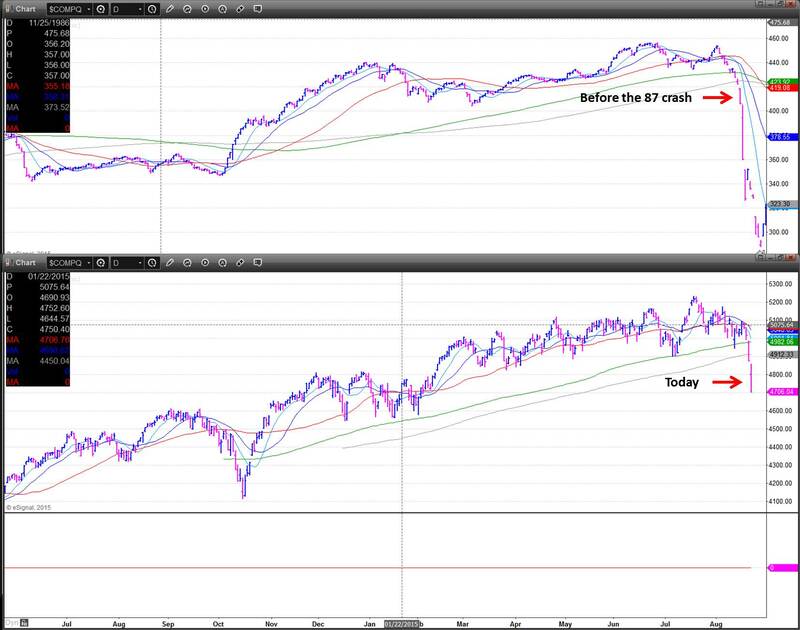 To finish, here is the SP500 big picture again. If we are in a bear then we should make lower highs and lower lows. But note that in a bear we still get some ripping rallies that test the overall downtrend. For now then, what’s important is that the rally of the last 3 days topples over in due course and eventually prints a lower low than October 2014 in all indices. 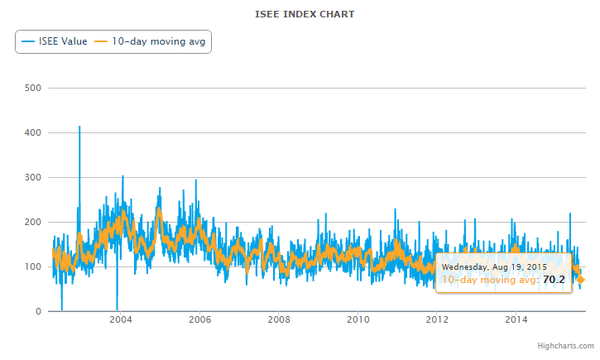 We have had significant geomagnetism in progress the last couple of days. 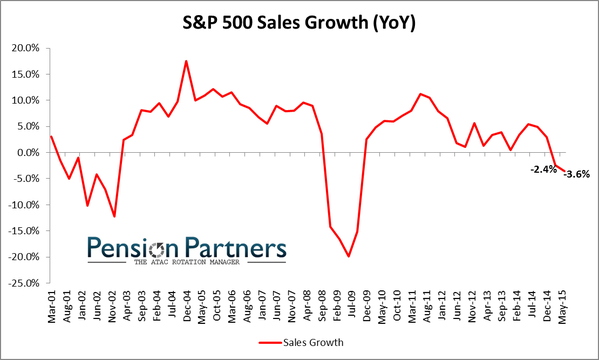 It adds to the recent cluster which acts as a negative pressure on market participants. I am short Biotech, Russell 2000, Dow and long gold. 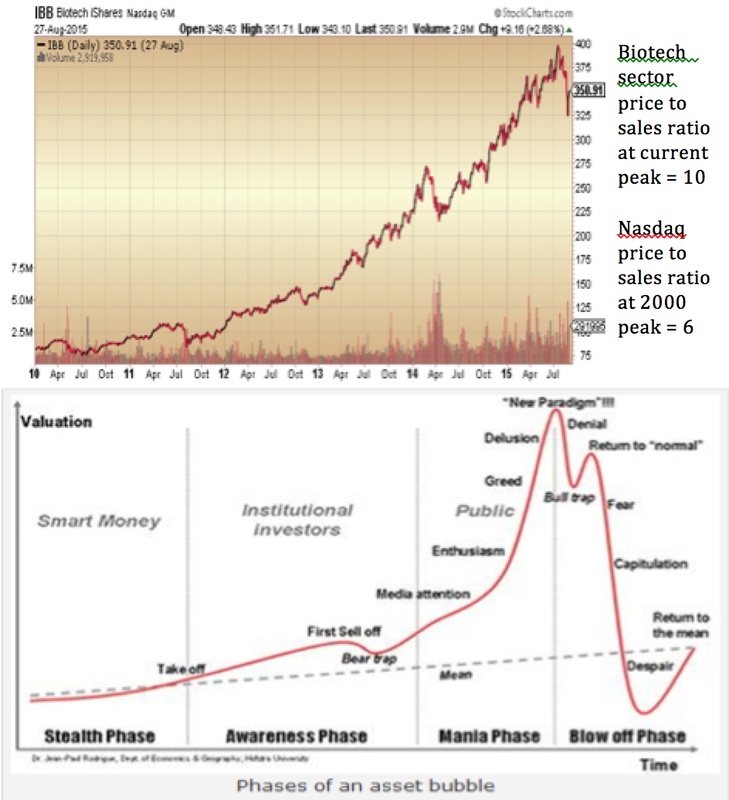 Then there are others which have either not washed out sufficiently yet or at levels whereby we might argue ‘done’ if just a bull market correction or ‘just getting started’ if we are now in a bear market. Here, Investors Intelligence sentiment, AAII sentiment, SP500 new highs new lows, NAAIM manager exposure, volatility, and the Arms index. 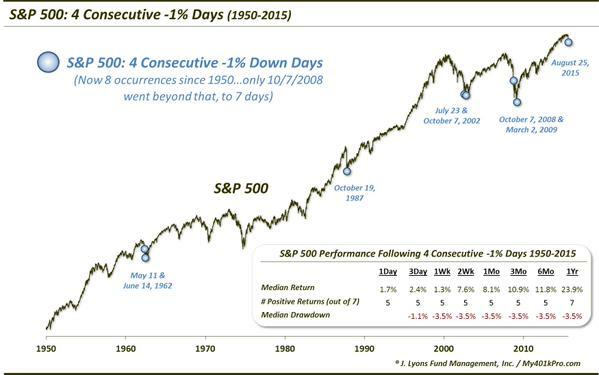 If we consider the 5% decline across the last two days of last week, it suggests we are in the territory of a nastier correction or bear market. Additionally, Friday was a major distribution day and one of four recent such events. 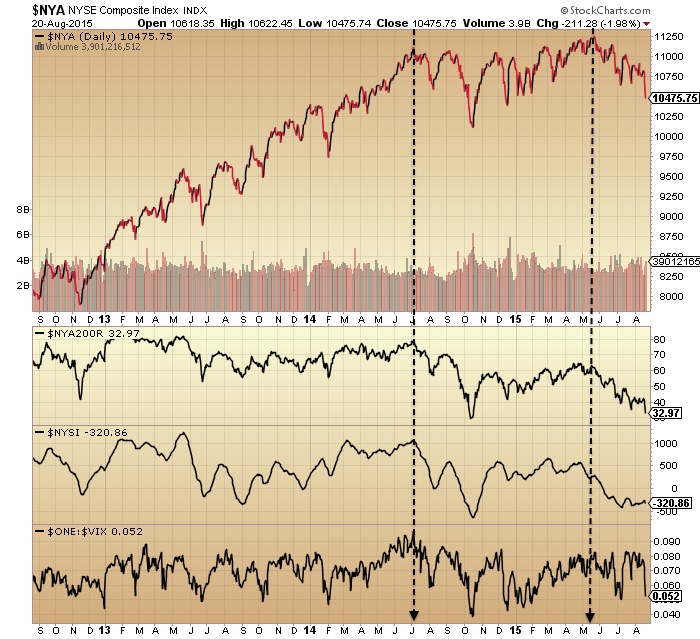 Major distribution days near the highs are a typical sign of a market peak. On the chart below, green above the line = major accumulation days (none in the last 6 months), red above the line = major distribution days. If we look at the SP500 chart we can see that the steepness of the declines of last week does not resemble the v-corrections of the last 2 years. 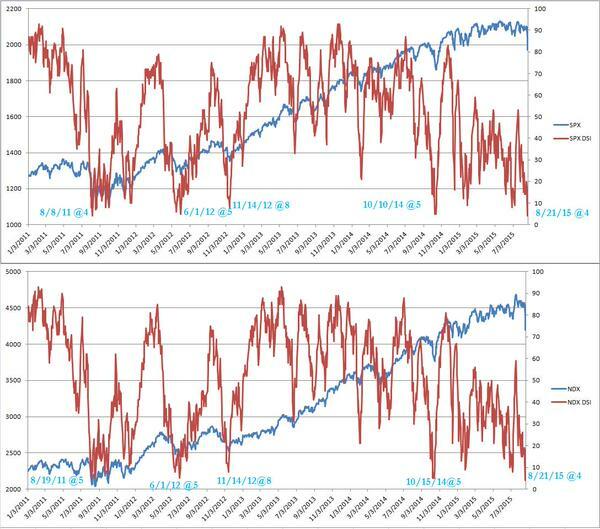 It looks more like the crash of August 2011 (also preceded by both an arching over in price and divergence in breadth), but notably without the volume spike that may signal a bottom yet. The heaviest falls in August 2011 took place on Monday 8th. Ditto Black Monday in 1987. 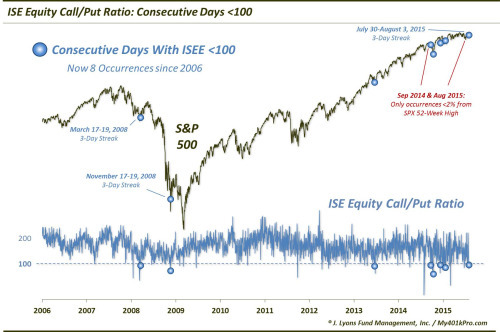 The reasoning is that investors have time to stew over the weekend and rush for the exits on Monday morning. 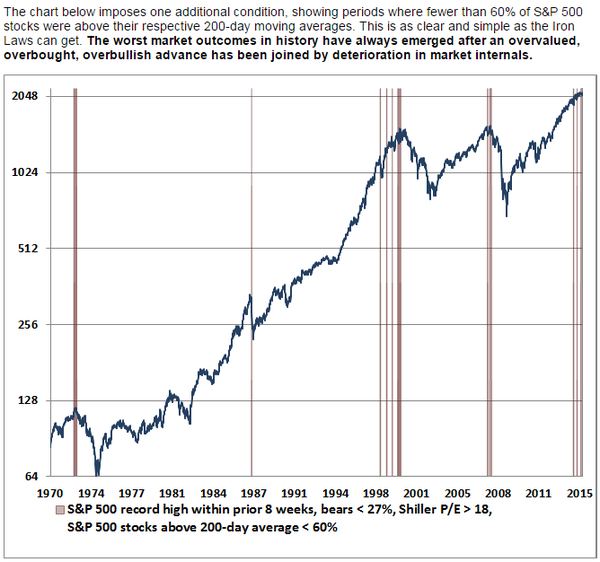 Typically stocks crash from oversold overbearish conditions, not from highs. So we have a similar set up here for tomorrow (CPC, daily sentiment, RSI all at oversold, overbearish), and a major down day is possible. Closing at the lows on Friday makes it more likely that we will open to further selling tomorrow. The question is whether buyers now step in and that can be turned into a reversal or consolidation day, which is also possible. 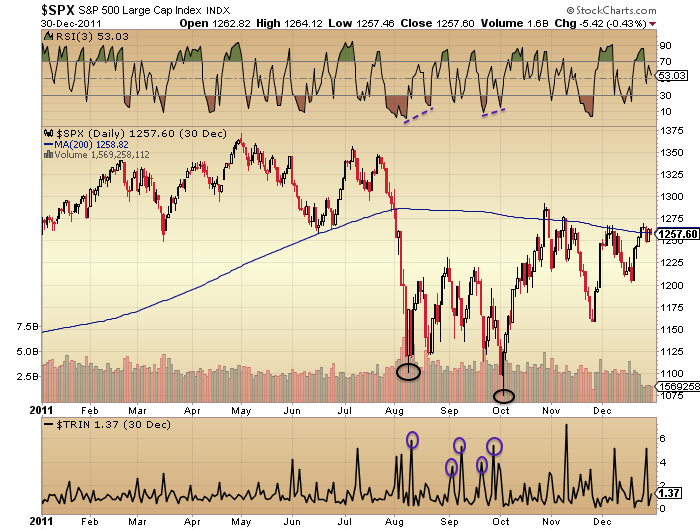 In short, certain indicators suggest a bounce should be near. 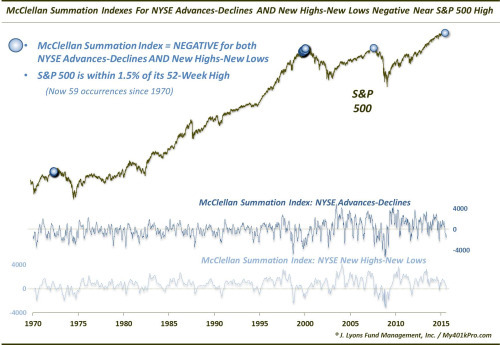 But the steepness of the declines and the bigger picture of the (likely) bear market suggest that we could drop further and trigger the more neutral indicators to greater extremes before a bounce. I suggest the best all round fit here is that we fall hard at the start of this coming week and then get a bounce soon but from significantly lower levels. I suggest a bounce is more likely on a high volume intraday reversal hammer candle and a bottom more likely to hold if it shapes out as a lower low on positive divergences. Both are absent so far. Here is 2011 for reference. Note we saw higher fear spikes than we currently have, two long tailed intraday voluminous reversals and two lower/twin lows on positive divergences. 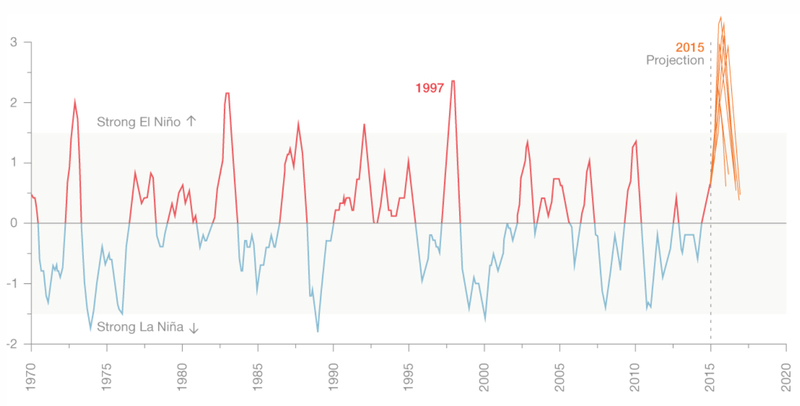 The weather phenomenon El Niño is partly responsible. 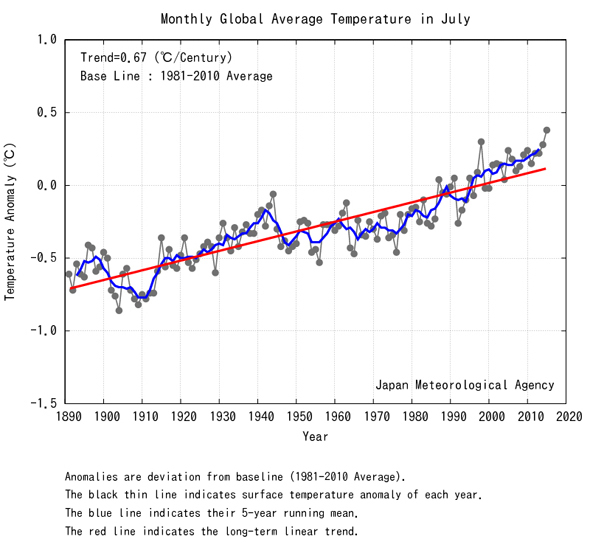 El Niño years are typically hotter than others. 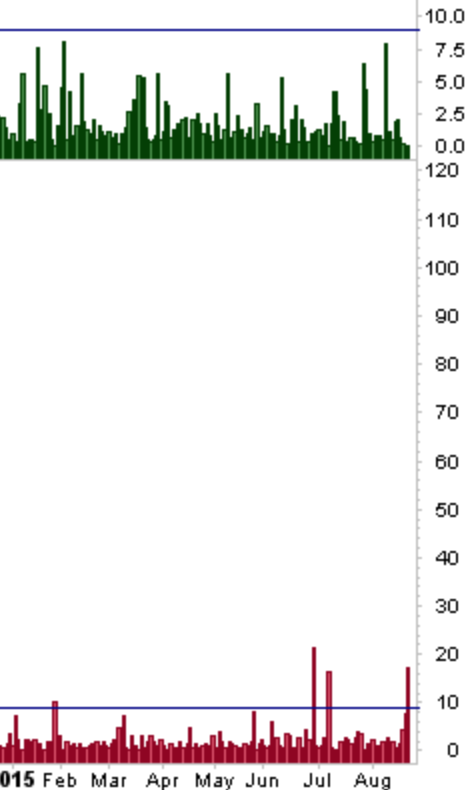 1997-1998 was one such event and gave rise to the outlier on the July chart above. Sea temperatures so far in 2015 suggest this could be the strongest El Niño yet. 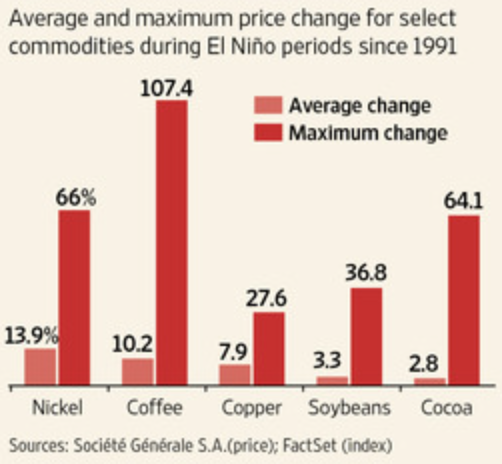 In short, some commodities may experience a price surge if factors converge, but a strong El Niño and record global temperatures do not guarantee a good return on a long basket of agricultural commodities, as the averages reveal. In fact Nickel turned out the best performer overall. But things are different now to 1998. 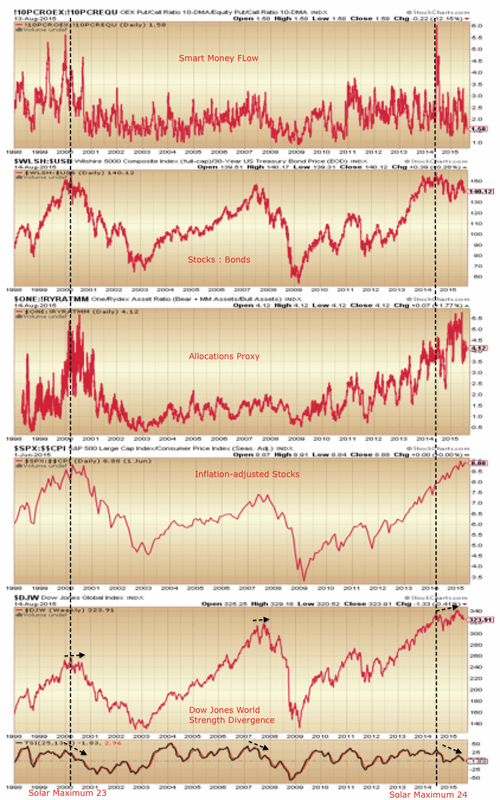 Stocks are likely making a bull market peak and deflation is the dominant theme. If we look back to the early 1930s, agricultural commodities were not immune from deflation: demand fell and so did prices. Yet, shortly after that, droughts (as may occur under El Niño) devastated harvests and prices shot up. The other factor here is the pricing in dollars. Long dollar is a fairly crowded trade currently, and a reversal there could give softs prices a boost. But if the longer term bull trend in the dollar persists then commodities may be kept under pressure. 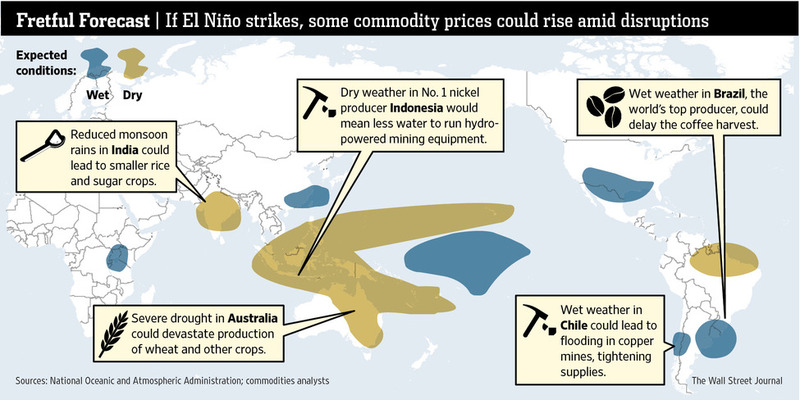 In summary, the potential for the hottest year and strongest El Niño on record are likely to cause natural disasters and disruptions around the world this year and into next, and certain agricultural commodities are likely to experience significant price rises where these factors converge with others. 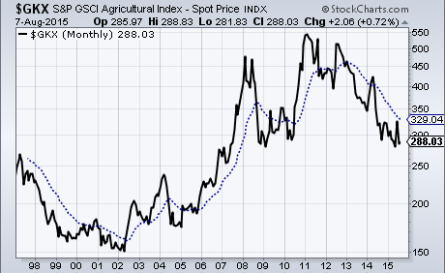 The broad agricultural ETF takes the guesswork out of which one(s), plus it is fairly beaten down and may represent a trade here. But the deflationary wave may intensify if stocks start to crumble, which could reduce demand further for commodities, and the dollar trend is also a factor. I’m going to watch developments for signs of supply being notably disrupted and hold off until we see agri prices accordingly waking up, should that occur.